Thermal inspection cameras are a tried-and-tested method for roof inspection. The ASTM Standard C1153 “Standard Practice for Location of Wet Insulation in Roofing Systems Using Infrared Imaging” dates to 1997. Thermal cameras provide the opportunity to inspect roofs in a non-contact or non-destructive manner. Regardless of if the thermal imaging camera is handheld or mounted on an airborne platform for aerial imaging, thermal inspection is relatively fast and affordable; and certainly, lower cost than destructive methods such as core-boring that are sometimes required. What is infrared imaging and why is it used in roof inspection? Different bodies (i.e. materials) will store thermal energy for differing lengths of time, the implications of which can be described in terms of their thermal mass, or more precisely, their thermal capacitance. Areas across a building’s roof will be made of different materials. These materials might also be of various degrees of condition (for example, dry versus wet). These factors all contribute to changes in thermal mass across the roof. During the day, heat is stored in the roof from the warming of the sun; at night, this heat is released in accordance with the properties of these differing thermal masses. A wet material (for example, wet insulation caused by leakage) will release thermal energy slower than if it was dry, as it will have a higher thermal mass – and so leads a team from a roof inspection company need to identify damaged or deteriorated areas that either need repair or at least be the subject of preventative maintenance procedures. 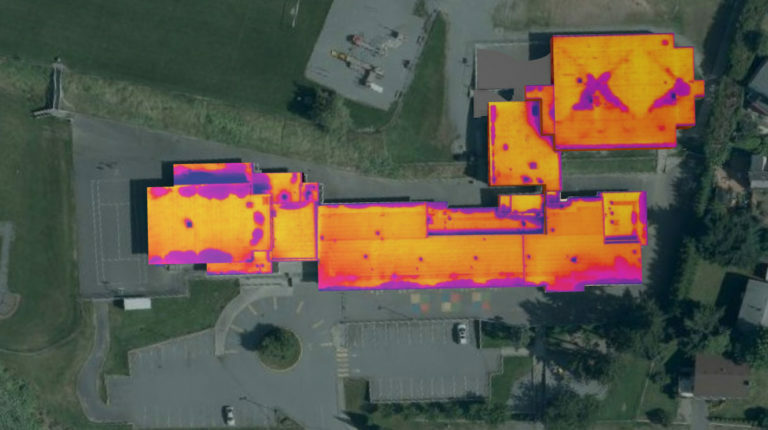 Both handheld and drone-mounted infrared cameras have been successfully used for roof inspection for several years. Roof inspection companies will have their preferences, but so long as the company in question has the relevant experience and qualifications, they should provide the necessary information to enable an efficient maintenance strategy for your assets. Nevertheless, what are the differences between different types of thermal camera and how they are used? When we discuss infrared systems, we need to be specific about we are measuring. Within the ‘infrared’ portion of the electromagnetic spectrum, we can further classify spectral response properties in accordance with wavelength. A body will emit near infrared across the entire spectrum; classifying spectral response does allow certain properties to be focussed on though. 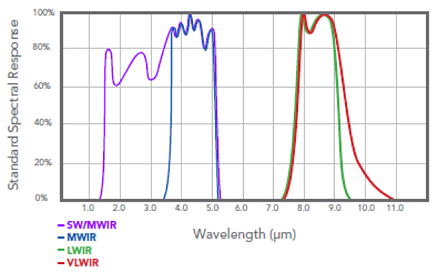 Figure 1 provides a representation of how wavelengths in the infrared are often classified; where SWIR stands for shortwave infrared, where MWIR is mediumwave infrared, LWIR is longwave infrared, and VLWIR is very long wave infrared. Responses in the shorter wavelengths (e.g. SWIR) can be sensitive to ambient lighting (sun, moon, etc.) and so can be referred to as being in the “reflected infrared”, while longer wavelengths (e.g. MWIR and LWIR) are not dependent upon ambient light sources and so are described as the “thermal infrared”2. As a rule, ‘hotter’ objects are considered to show-up well in MWIR imagery2. MWIR images can also show a fine-range of graduated differences in response between pixels in a scene, especially when extremes in spectral response are involved. Conversely though, can be prone to oversaturation if there is too wide a temperature variation between objects in a scene, which leads to difficulties imaging at background temperatures5. Alternatively, LWIR have a larger dynamic range, and so can be more sensitive to intra-scene variation in response; and this can be true regardless of whether temperature variation across the scene is generally low or high5. The extent to which fine spatial variations might be seen between objects might be compromised though. Typically, a roof inspection company might use a MWIR handheld camera, or utilize LWIR data collection from an airborne (now usually, drone services) platform. The advantages and disadvantages to both the agency undertaking the roof inspection and the customer of the roof inspection, need to be assessed not only in terms of the technical characteristics of the sensor, but also the implications of how it needs to be implemented. These characteristics are compared in the following tables. Increased sensitivity among reflective (i.e. ‘cool’) roofs. Increased scaling values in output images can make results easier to interpret. Reduced dynamic range could mean reduced sensitivity across all material types. Roof inspector can mark location that requires maintenance directly on the roof6. Roof inspector can provide inspection notes of increased detail as to what the item of degradation is on the roof. Cheaper and faster than destructive methods of testing. Using a handheld scanner puts inspection staff at significant health and safety risk. Falls from roofs are the most common reason for fatalities in construction in North America. · Risk increased during dusk or night-time conditions when thermal energy is being released from the roof. The entire building envelope (i.e. not only roof, but also exterior walls and facades) cannot be inspected without the use of rope access, scaffolding, or risers. · Roof inspection team exposed to increased health and safety risk. 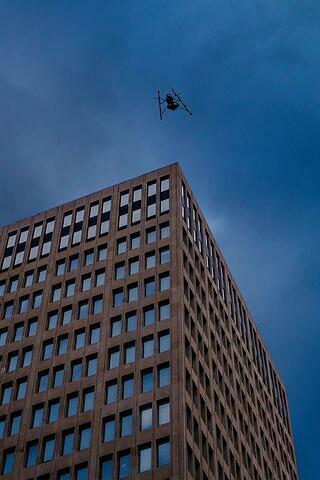 · Increased thermal venting between camera and target. High dynamic range leads to increased sensitivity across dark, cooled, roof structures. Inspection personnel do not need to climb the roof. · No requirement for rope access, rises, ladders or scaffolding. 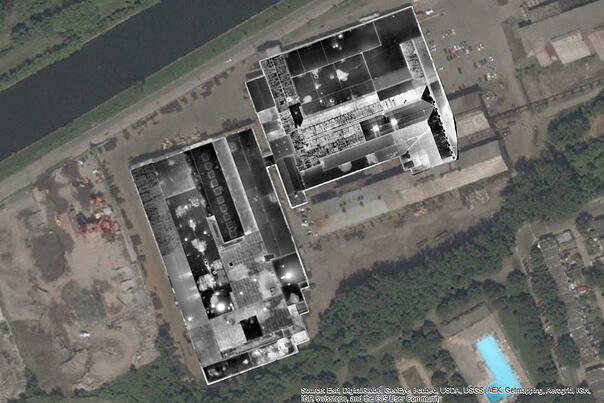 The entire building envelope, including hard-to-reach areas can be imaged. Thermal ghosting (or leakage) is minimized by high straight-on view of the roof by the camera. A complete, georeferenced report can be provided to the client. Much faster to complete inspection than with a hand-held camera. Nighttime flight certifications are required to fly at the optimum time of thermal release across the roof. The roof inspector will not be in situ to a location of damage. · Will not be able to mark the location of damage on the roof itself. · Might not produce as detailed notes as to the exact nature of the damage. Whether using handheld or drone-based technology, these non-contact inspection methods reduce both the overall cost of undertaking the inspection, but also building maintenance costs later due to the opportunity that they provide for implementing preventative maintenance procedures. Ultimately, the technology used for the inspection may be the subject of corporate preference. While MWIR handheld scanners produce reliable results, and can provide better indications across certain types of surface such as highly reflect roofs; their implementation brings a significant health and safety risk. At Industrial Skyworks, we believe in minimising health and safety risk to both inspection personnel, and our customers. Therefore, we have invested in drone-based inspection workflows that provide a complete view of the health of the building, and reporting mechanisms that are validated by qualified experts in our in-house team. With the wide-dynamic range, we use drones equipped with LWIR cameras to gain a view of thermal capacitance across the entire building envelope. Drone inspection methods keep personnel off buildings until necessary, and keep our own teams on site for the minimum amount of time. Where closer inspection is required, we are able to direct inspection using handheld cameras to specific locations, and so keep issues of risk management at the fore of everything that we do.